A successful career path begins with knowing yourself, advise energy sector experts Natalie Birdwell and Jason Massey. 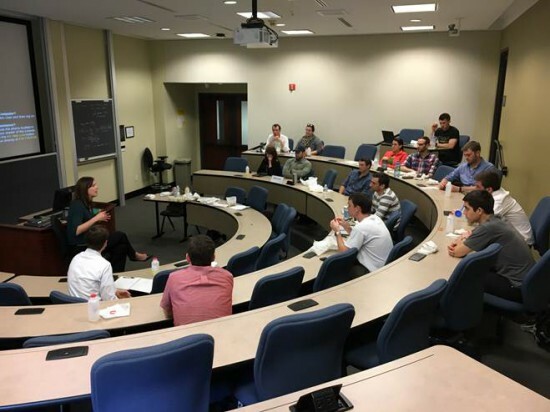 Natalie Birdwell (Class of 2013 alumna from UNC Kenan-Flagler Business School’s MBA program and Kenan Institute Leadership Fellow) spoke to the MBA Energy Club on Tuesday, February 28. With a distinguished background including former Executive Director of the North Carolina Coal Ash Management Commission, founder of Salient Sky Strategies, and UNC-Chapel Hill alumni, Ms. Birdwell continues to support and engage Kenan-Flagler students. She emphasized the importance of working hard and taking every opportunity, but also reminded the students to keep looking up, being more inquisitive, and to look at every possibility that may be available to them. Ms. Birdwell also stated that it is critical to know yourself better than anyone else, and “while there are always people willing to help you and provide advice, if you cannot somewhat articulate what you’re interested in and how you want them to help you, you will be a stalemate.” While keeping your head up and knowing yourself, continue to be inquisitive and keep a running list of opportunities that maintain your interest, Ms. Birdwell said. Our guest speakers explained how we all can better prepare ourselves for careers in both government and the private sector, bridge the gap between the sectors, and make the most out of a career in Energy.